SKOPJE, Macedonia (CNN) -- About 2,000 people, apparently angered over NATO airstrikes in neighboring Kosovo, staged a protest Thursday at a hotel in the Macedonian capital of Skopje. The hotel was housing journalists, officials from NATO and the Organization for Security and Cooperation in Europe, which is Europe's main security body and has until very recently had hundreds of truce monitors in Kosovo. About 200 police were called out to handle the ethnically mixed crowd, which started to smash vehicles outside the hotel. The crowd shouted anti-American slogans and some protesters were seen moving toward the U.S. Embassy. A NATO helicopter, attempting to land across the street from the hotel, was forced to lift off again after the crowd surged into the field near it. 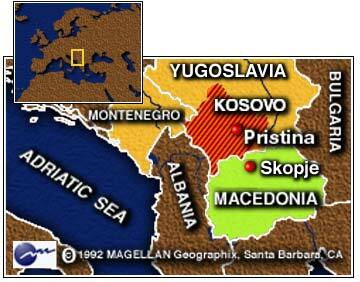 About 10,000 NATO troops are in Macedonia. The force is not part of the NATO offensive against Yugoslavia but is intended to serve as a peacekeeping force for Kosovo, should a Kosovo peace agreement eventually be reached. About 25 percent of the people in Macedonia are ethnic Albanians, and there have been fears that the armed conflict in Kosovo could spill over and drag the region into the conflict. Macedonia has considered itself as neutral in the separatist crisis, observers say, and there is some fear that the presence of thousands of NATO troops could lead Yugoslav President Slobodan Milosevic to order a retaliatory attack on the area.